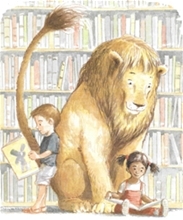 "In Michelle Knudsen's delightful picture book, Lion walks into the library one day and decides to stay for storytime. The librarian says that he may remain there and help maintain the library provided he obeys the rules and doesn't roar. When the librarian falls from a stool and is injured, the only way Lion can get help for her is to roar. Realizing that he has broken the rules, he leaves the library. Happily, he's fetched back and once again becomes a favored feature of the little library. Christine Marshall provides a beautifully modulated reading of this charming book, giving each character a distinct voice. Less successful are the sound effects that are very faint even when the volume is turned up high. Track one features page-turn signals. Be sure to have the book available so listeners can peruse Kevin Hawkes's wonderful acrylic-and-pencil illustrations that are integral to the telling. A fine choice for storytimes." "No roaring allowed! Well, sometimes rules need to be altered if there's a very good reason! Normalcy prevails at Knudsen's Library-story hours with attentive youngsters, patrons browsing the stacks and using computers, librarians providing assistance. But then a lion walks through the door. What's normal about that, and how will Miss Merriweather handle the personal and personnel problems that arise? Christine Marshall has the calmness of a lion tamer and a librarian. She lets the subtleties of the plot and the humor speak for themselves. Her quiet tone gives way to dramatic punch when the lion shows up; her pacing heightens the pleasure in each twist of the story. Poring over Kevin Hawkes's illustrations while listening brings additional pleasure."